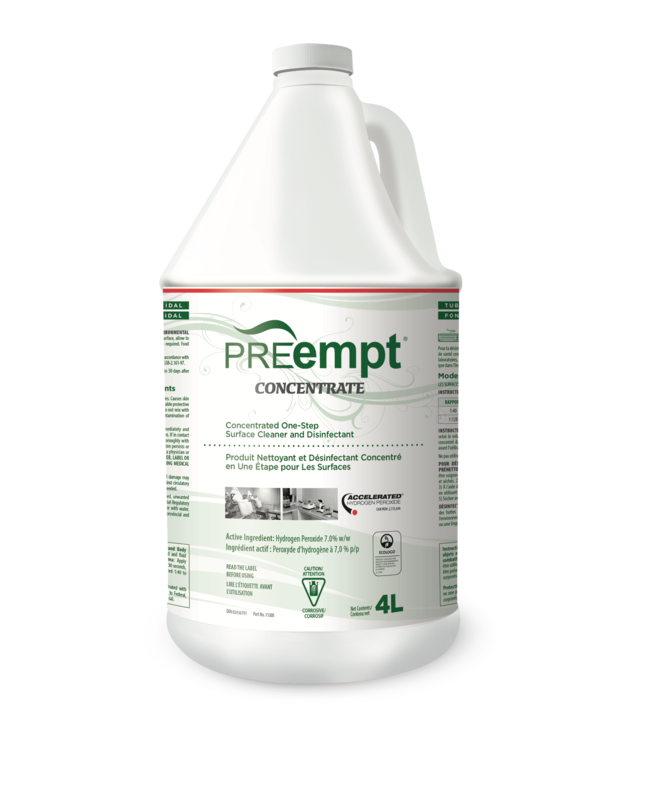 PREempt™ cleaners and disinfectants are based on the patented Accelerated Hydrogen Peroxide® (AHP®) technology and were designed with four key pillars of strength in mind: Cleaning Performance, Germicidal Efficacy, Personal Health & Safety, and Environmental Sustainability. Accelerated Hydrogen Peroxide® (AHP®) technology has been validated by over 34 studies published in reputable journals around the world and recognized by multiple guidelines including Provincial Infectious Disease Advisory Committee (PIDAC) Best Practices, Infection Prevention and Control Best Practices for Personal Service Settings Protocol, Centre for Disease Control (CDC) Guidelines, and Public Health Agency of Canada (PHAC) Guidelines, to name a few. 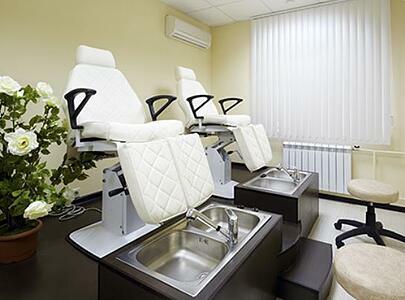 For more information regarding AHP®, please click here. 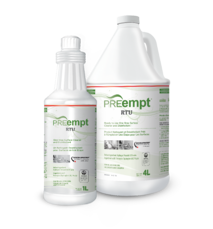 Cleaner- Effective disinfectant as well as a cleaner resulting in added confidence that disinfection can occur. 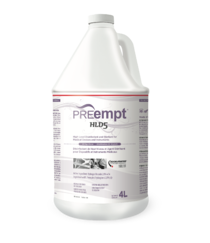 Faster - Rapid and realistic contact times against a broad spectrum of difficult to kill pathogens. Responsible - Designed to be easier on surfaces, staff and occupants. Users are not exposed to VOCs (volatile organic compounds) and Personal Protective Equipment is not required for in use solutions as per health and safety rating. Sustainable - The active ingredient, Hydrogen Peroxide, breaks down into water and oxygen leaving no active residual which helps to reduce environmental impact. 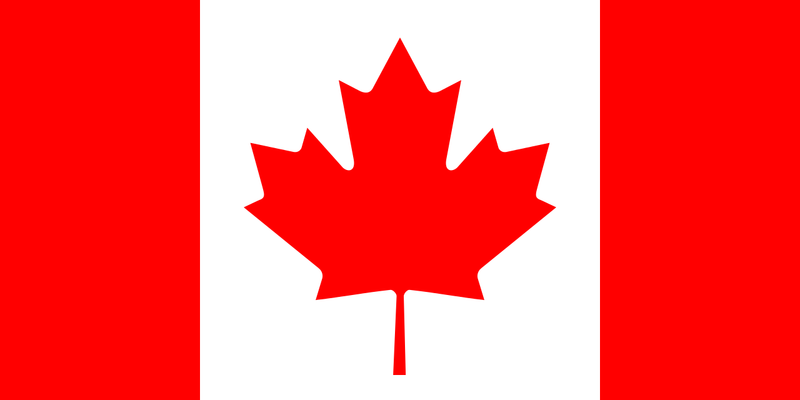 For information on how to purchase product, please visit our Where to Buy section on the Virox Website. 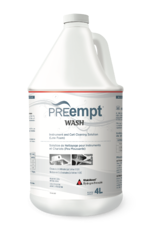 PREempt™ One- Step Surface Disinfectants and Cleaners are designed for use in many environments including Day Spas, Esthetic Schools, Massage Therapy Schools and Spas, Medical Spas, Hair and Nail Salons, Tattoo Parlors and other Personal Service environments where broad-spectrum germicidal performance in short contact time is required. 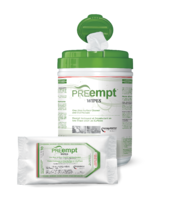 PREempt™ is specifically formulated for cleaning and disinfection of hard non-porous surfaces. 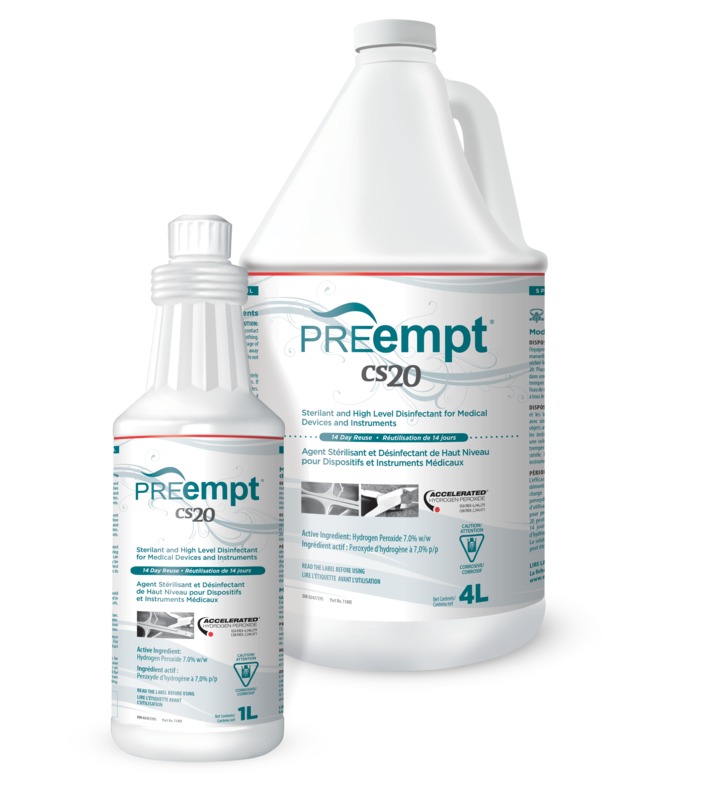 PREempt™ Instrument Products provide the perfect balance between Safety and Efficacy, by providing a more responsible solution to disinfection without the use of harmful chemicals such as Aldehydes, nor does it require any special ventilation. To purchase Test Strips or to receive Workplace Labels, please contact your distributor. © 2019 Virox Technologies Inc.